It’s not often that I post a commercial. When is the last time I posted a commercial on this blog? If I have, I don’t remember it. Yes, this is the kind of weird commercial product that ONLY Tim and Eric could make. And GE paid for it. Perhaps they’ve seen the light? Did I mention the commercial co-stars Rang? Yes, you’re still on planet Earth and not in the Twilight Zone. I find it difficult to visit the small towns of South Dakota and Nebraska. As someone who grew up in just such a small town, I find this disconcerting. I was raised in Crofton, Neb., which was a fantastic place for a child to learn and grow. Between the farm upon which my family lived and the small community where I went to school and took part in many other functions, I was given a warm and loving embrace within which to discover the universe and my place in it. However, like so many small towns in this corner of the world, Crofton’s population is dwindling at a slow but incontrovertible pace. The Census in 2000 had counted 754 souls within the community. By 2010, that had shrunk to 726. The 2012 estimate set the population at 710. Death and migration are gnawing away at Crofton and many other small communities in the Great Plains. And it is this fact that I cannot get out of my head when I visit these places. Speaking in general terms, their infrastructure is aging and the unforgivable impacts of our demanding, fickle climate are becoming harder to conceal. Young people are increasingly rare, and the adults are noticeably, overwhelmingly getting older and older. The young people who have stayed behind are often forced to accept challenging economic conditions as part of their decision, and that can wear down an individual in the same way the weather beats down a structure. In the larger scheme of things, I suppose this doesn’t really matter. Towns live and towns die. They have for millenia. Humans migrate and civilization carries on, forgetting many of these places even existed. Maybe what makes this depopulation process more difficult for this region is the fact that it has such an agricultural heritage. As someone who grew up on a farm, I think there is a connection to the land that stems from that lifestyle that is very personal. It’s probably the closest I’ve come in my life to feeling a spiritual, mystical connection to something. The geography of this region is sacred to me. I’ve always felt that way. These rolling hills feel like HOME. I can’t imagine obtaining that feeling from any other place. It’s a strange dichotomy to watch this land produce higher and higher yields to sustain more and more life, and yet the people are disappearing from the landscape. Some individuals have left. Others have gone to rest in the serene depths of this rich soil. There are fewer and fewer of us to watch this process take it’s toll. There are fewer and fewer of us to care. Maybe it’s the best thing for the land. Perhaps other life will spring up to take the place of our domineering presence, extract less from it and create a more harmonious countryside. I can accept this and even appreciate it. Humans are a part of life on this planet. They are not life itself. But I can’t shake the feeling that the Great Plains are increasingly becoming a glorious temple with few left to appreciate its beauty and worship within its elemental walls. As my temple is forgotten by the larger community, I feel increasingly forgotten, too. Yes, there is still much joy to be had. There are people to celebrate. We can dance in the dandelions and rejoice in the muddy waterways. But it’s becoming harder and harder to ignore the shadow. Death and isolation creep along the empty roads and decaying farmhouses and lay their cold hands upon us more than we would like to admit. Sometimes, I think it creates a sort of desperate madness in us to defend our presence here and wonder with indignation why others would not want to join us. How do we hold on to our sanity as this growing shadow seeps into our consciousness? How do we become oblivious to the obvious? We are once again pioneers, trudging our way through a new frontier. But instead of being fueled by dreams and hope, we are being catapulted by reality. Despite the pain it causes, we know the time has come to commune with ghosts and learn how to say goodbye. It’s difficult for us to admit, but the Great Plains don’t need us to survive. For an interesting historical perspective on debates over population in the Great Plains, I recommend giving this Nebraska Public Radio interview with economic historian Derek Hoff a listen. 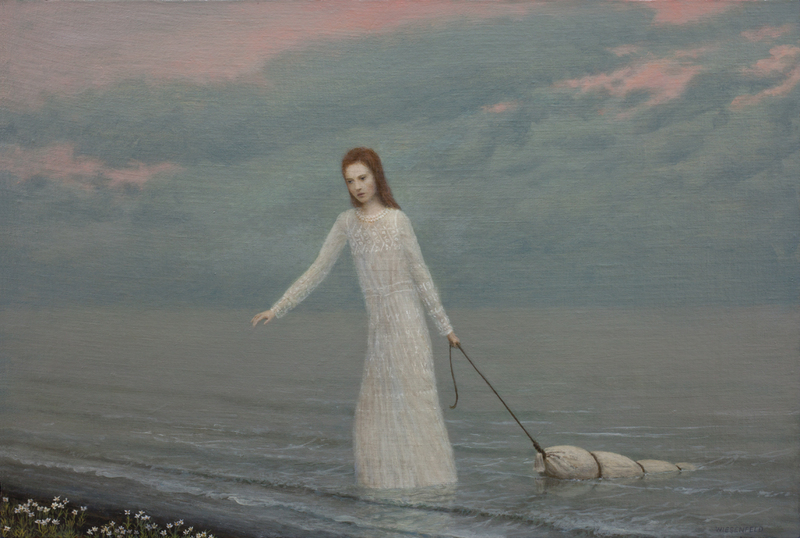 “The Lake” by Aron Wiesenfeld. Find out more about the artist here. You found me in the wide and starry sky. I was trying to hide, to draw warmth in its dark corners. But your eyes found mine. And your lips found mine. In that vast sea, I’m not sure how you were drawn to me. Maybe you couldn’t tell how far I had gone. My lifeline had been unraveling for a year, maybe more. When you pulled me in, I don’t know if you realized what you had caught. I was probably more distant than I knew, nothing more than a pale blue dot. Love may be a stream, and we can hope it keeps flowing. I think that’s true for me, even if I can’t feel it coursing through my body presently. It is easier to trace in the past, once you’ve been overtaken by its current. I just have to be careful not to be derailed by dangerous, tempestuous memories. The first thing you did was cover my eyes and call my name. I hadn’t heard anyone say it so softly, so kindly in a long time. You pulled away the dust and debris, and you coaxed my pulse up to speed. When I opened my eyes, you were smiling. And I suppose I couldn’t remember how to cry, so you were saved from that pitiful sight. My voice was only an echo in my mind, but you listened as if you could ascertain every word. I don’t know what you saw in me. I don’t know what you heard. But you stayed and swam with me until we reached the shore. You told me the heavens are no place for heavy hearts. It’s too easy to drown in that darkness between the stars. Your patience and laughter began to heal the scars. And what did I give you in return? I wish I could say with some certainty. I tried to give you what you asked for, but I don’t think I had it in me. At the very least, I hope I gave you some understanding. Love streams may start, may stop, may slowly dissipate. We try our best to control them, to harness their energy. But all we really know is we must savor each drop. Whether we think we know where that drop is going or where it is not. It has the power to fulfill us or abandon us to despair. Ultimately, love streams are the most frightening force of nature, and we must look to each other for safety, for repair.